Yet again for the second year in a row, Tacloban City was threatened with what was going to be a super typhoon, the strongest one of the year. But thank God Almighty, she was spared though not without a thrashing. With an intensity of 180 kph (maximum gusts) and the typhoon lingering for 8 hours, Tacloban was once again pummeled though not and hopefully never as forceful as typhoon Haiyan/Yolanda. Tacloban was not identified as being in the critical area but was in the extreme areas of the storm map. A storm surge was not expected but the Taclobanons would not throw the dice this time, as it was noted all over the city and as early as Wednesday afternoon (Dec. 3) people queued up in all the supermarkets and grocers for preparation. Taclobanons who were in precarious areas voluntarily evacuated to designated shelters and when all was said and done, the city had no casualties. Thank God again! I took shelter at my family's house in Marasbaras which has 2-storeys, it worked well structurally but I was not exempt from feeling the jitters and anticipation on when the howling and whipping of the wind would stop. Typhoon Yolanda/Haiyan survivors however assured me that Ruby did not hold a candle to that dreaded other one. It was a certifiable tempest but we did not feel as much as the citizens of Dolores, Eastern Samar where landfall was expected. Prayers and support to all the victims in Dolores, E. Samar. 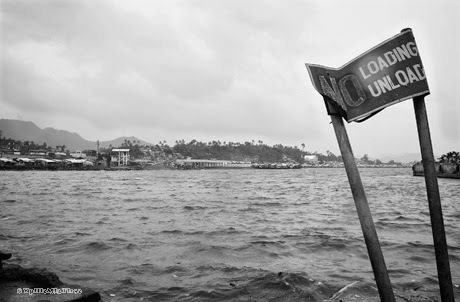 Leyte's vulnerable areas were the shores of Barugo, Carigara, Biliran, Capoocan and all the western side of the isle. With the eye of the storm situated at the north of us, the waters were being pushed counter-clockwise hence the possible surge on the banks of the aforementioned places. Truth be known, I do not know how the typhoons would resolve in Leyte and the Philippines in general or if it ever will and how intense it would be each passing year. Growing up, I only knew of 2 other super typhoons that wrought quite a devastation in Tacloban. With last year's Yolanda and this years Ruby, I am wondering if this indeed will just be like what everyone is saying as "the new normal?" God forbid.